Looking for a car that slaps a smile on your face? 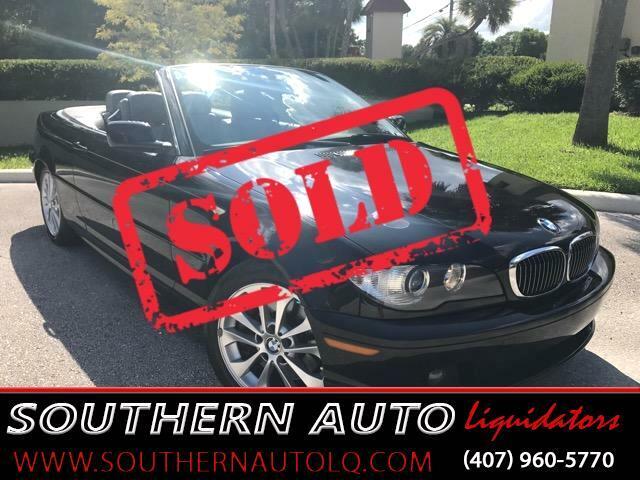 This beautiful black sapphire metallic 2005 BMW 330ci convertible will not disappoint. Anyone who knows me will say I prattle on endlessly about the 3-series, overall, and the 330ci in particular, regarding their endless driving pleasures. Leave it at this: The 330Ci remains the finest mid-size sporting two-door on the planet. Now add to that a power convertible top. And it just doesn't get better than that. This 330ci is in absolute beautiful condition and I love this part of my job: The test drive... Wow, this car flows smoothly though the gears, it loves the road, hugging the curves. The BMW 330Ci features a 3.0-litre engine with 24 valves, DOHC, variable valve timing, and six cylinders. All of these points factor into a resulting 225 horsepower for an exuberant highway drive. We have the books and tons of maintenance records on this car. This BMW's Equipment includes adjustable power front seats with driver's position memory electronically tagged to the key, remote keyless entry, power windows, cruise control, cabin-air filtration, fog lights, rain sensor, 6 cd changer, leather seating, fine wood trim, 17-inch alloy wheels, includes fully automatic soft top, rollover protection system, xenon lights, sport leather steering wheel, ABS Brakes, Air Conditioning, Alloy Wheels, Traction control w/Dynamic Stability Control , AM/FM Stereo, Auxiliary Audio Input, CD Audio, Hartman Kardon Sound System, Cruise Control, Leather Seats, Power Locks, Power Mirrors, Rear Defroster, automatic climate control, privacy glass, eight-way power seats with memory, illuminated vanity mirrors, front reading lights, footwell lighting, heated seats, it really does have it all. This BMW 3 series offers excellent handling, performance and smooth quiet drive. Steering is sharp and responsive. This 330 is exceptional. Come by today. You won't be disappointed!!! Drive Fun, Drive Safe, Drive Cool.